I understand privacy issues. I'm a pretty private person despite my forays into publishing and social media. But I'm also a warped individual. I'm okay with a nameless government program logging my calls because, who uses the phone these days? Heck, since I've succumbed to Facebook no one even texts me anymore, let alone emails or calls. I'm okay with the government using the front facing camera on my phone to watch my reactions to cat videos on Buzzfeed. I'm even okay with them knowing my disgusting habits, like watching cat videos while using the restroom. What I'm not okay with is some nameless intern taking that footage and posting it to some weird toilet cat video reaction fetish website. Look, I've mentioned before that some of my internet searches related to book research could easily be interpreted as suspicious. I've looked up weapons, explosives, historical serial killers, the ethics of genetic engineering, and most recently, mind controlling substances. So far the feds haven't come knocking. No, the government isn't really my concern here. My real concern is my beloved electronic friends. Anyone who has ever had an email address or a Facebook account knows that companies aren't above using your drunk party pictures or embarrassing email confessions to sell you stuff. Back when my husband and I were planning our wedding, our Gmail sidebars were cluttered with wedding planners, Vegas hotel deals, cheap flights, and disturbingly, divorce lawyers. Every time I sent my book drafts off to someone to proofread I would be inundated with self-publishers, proofreading services, or booksellers. I've gotten used to it and frankly, it beats the old days of prescription-free Viagara, $99 laptop deals, and dancing aliens who are excited by low mortgage rates. At least the intrusive ads were sort of relevant. All emails for the last several years have been like the one on the bottom, and all since have added the Cost Plus just to mess with me. Odd coincidence, right? Most likely. I mean, that is the full name of the company. It's just a case of odd timing. But then there was the Fitbit incident. Fitbit is kind of like a glorified pedometer that tracks my steps and calories burned, and uploads the information to a website that then sends me emails, congratulating me on not being a couch potato. (It's pretty easy to not be a couch potato when three dogs claim all of the best couch real estate.) The device is pretty small, so small that it calls me "CM" because my name doesn't fit on the screen. But if it's inactive for a while, and I pick it up, it gives me a little motivational message that makes sense about 15% of the time. It's like it totally gets me. Well the other night, my husband and I were speaking in French, you know, like normal couples do while standing around the kitchen and feeding carrots to their dogs. 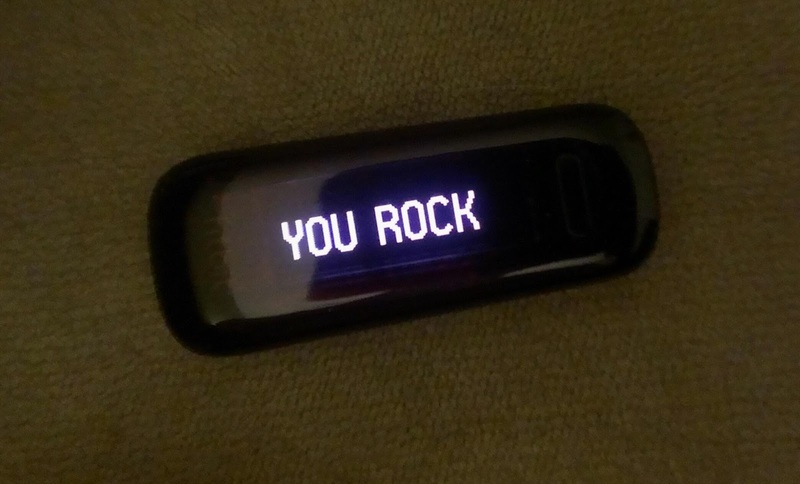 I realized Fitbit was on the table and therefore not calculating all the carrot-feeding calories I was expending, so I grabbed it, and was met by the message, "Bonjour, CM!" Now what makes this weir is that Fitbit usually recycles the same 10 or so phrases and I'd never seen this on before. Freaky? Uh huh. But it also says stuff like, "Vamos!" and "GOOOAAAL!" so it's possible that Fitbit just has a bit of international flare. Okay, how about this one. Have you ever browsed the internet looking for something specific, only to have the item you searched show up in ads on random websites that were not related to your search? Of course you have, that's what cookies do. But let's go deeper. What if you weren't even browsing the internet? What if you were talking to someone about the average rainfall in Bora Bora and to settle the argument, you do a quick Google search. Now, you have never searched for the average rainfall in Bora Bora before, heck, let's pretend you've never even heard of Bora Bora before so there is not even the remotest possibility that Bora Bora has ever been typed anywhere on your computer. But when you start typing, you only get to "aver..." before Google auto-populates the entire phrase, "average rainfall in Bora Bora." Could that possibly ever happen? And it did, to my husband. I don't remember what we were talking about, but he wanted to look something up that we had never heard of before and he only got a few letters typed before Google suggested the entire obscure phrase. Now that one I have no explanation for other than the possibility that many other people were looking up the same obscure phrase. I wish I remembered what it was. I am confident that it wasn't the average rainfall in Bora Bora*. *I'm curious now to see how many poor folks, who legitimately would like to know the climate statistics of Bora Bora, are directed to this post.